A person who develops stand-alone software (that is more than just a simple program) and gets involved with all phases of the development (design and code) is a software developer. Some of the notable software people include Peter Norton (developer of Norton Utilities), Richard Garriott (Ultima-series creator), and Philippe Kahn (Borland key founder), all of whom started as entrepreneurial individual or small-team software developers. 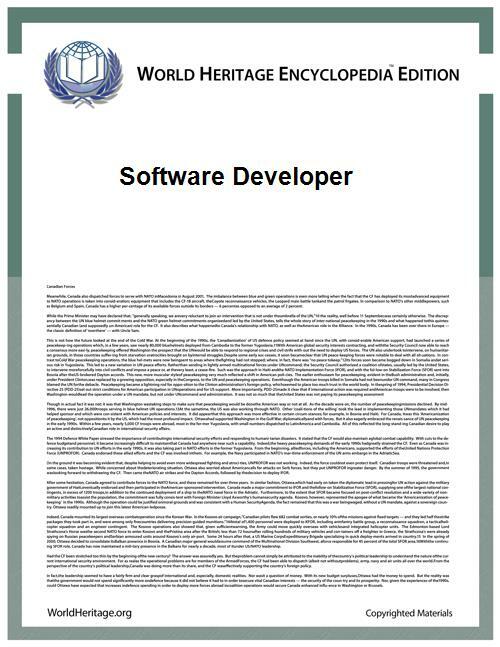 A great variety of software companies and programmers in the world comprise a software industry. Software can be quite a profitable industry: Bill Gates, the founder of Microsoft was the richest person in the world in 2009 largely by selling the Microsoft Windows and Microsoft Office software products. The same goes for Larry Ellison, largely through his Oracle database software. Over time, the software industry has become increasingly specialized. Non-profit software organizations include the W3C, IETF develop software standards so that most software can interoperate through standards such as XML, HTML, HTTP or FTP. You would also have to understand the basics to a computer. Also take computer science classes. Other well-known large software companies include Novell, SAP, Symantec, Adobe Systems, and Corel, while small companies often provide innovation. You would need to work a part-time internsip to become a software developer. The software industry expanded in the early 1960s, almost immediately after computers were first sold in mass-produced quantities. Universities, government, and business customers created a demand for software. Many of these programs were written in-house by full-time staff programmers. Some were distributed freely between users of a particular machine for no charge. Others were done on a commercial basis, and other firms such as Computer Sciences Corporation (founded in 1959) started to grow. The computer/hardware makers started bundling operating systems, systems software and programming environments with their machines. Developers make software for the world to use. The job of a developer is to crank out code -- fresh code for new products, code fixes for maintenance, code for business logic, and code for supporting libraries. ^ Elmer C. Kubie (Summer 1994). "Recollections of the first software company". ^ Hardiman, Nick (24 July 2014). "A portrait of the modern cloud developer".